I am new to the forum but keen to by an IG32 in the next 12 months in Australia. Being single screw I am considering fitting a bow thruster to assist with marina manouvering. Can anyone advise if this is feasible and approximate cost? $USD is ok I can convert. It is absolutely feasible and the price is totally dependent on make, type and who will do the work. I just finished a low budget project myself today. I installed a Sideshift bowthruster. List is around $4,000 but you would also need to buy the battery wiring extra. In my case that was about another $400. It is a do it yourself job. If you want and can afford a conventional through hull bowthruster I would suggest that the cost would approximately double. Here are a couple pictures I took today upon finishing. One before bottom coat and one after. Thanks love your simple idea. However, what I had in mind was through hull and if there is sufficient space between the bow and watertight bulkhead. If nothing else, it might help you when dealing with a yard. I have been around boats for a LONG time and I have never seen this style if install. What does it do to the efficiency of the boat with the induced drag. It also looks like extreme care will be needed if you ever creep up on the stem as you power forward to relieve strain off the windless when pulling the hook. Gee, that installation looks very vulnerable as well as creating drag. 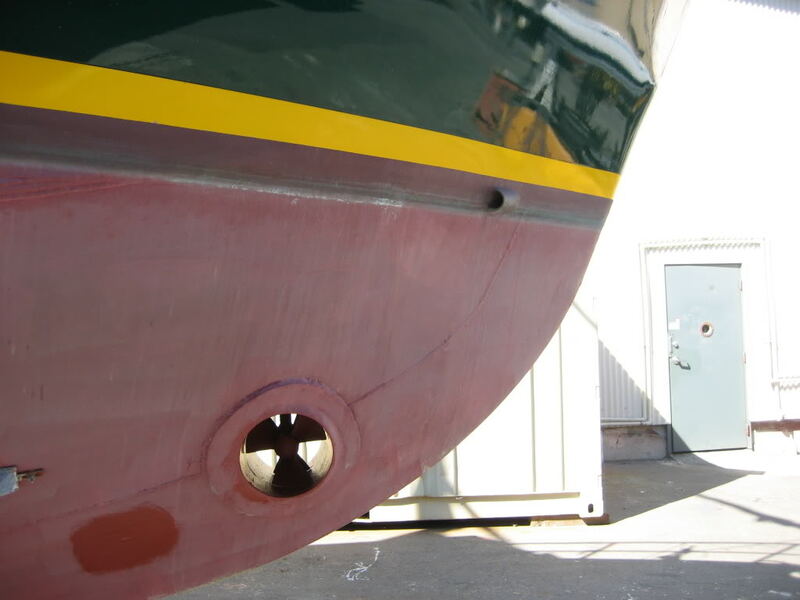 Believe a proper bow thruster is through-the-hull. My boat builder (in China) charged $5500 for a 24V unit. Welcome Mark. A while back I had a quote from a local seller advertising retro fit bow thrusters, it mounted externally but was moulded to the bow. About 9K without fitting/electric connections, from memory. Too much. I imagine "thru-hull" will be more. Investigate importing a kit from US, even with the AUD fall, freight, and GST. Try Defender.com. You`ll be surprised. Some 32s had twin 80hp Ford Lehmans. I know of 2 in Sydney, one raw water cooled (avoid),one with heat exchangers, so check around. The 32 has almost the same saloon space as a 36. Check the Halvorsen builders section here for common IG issues. Surely there must be tremendous vibration that will lead to pretty rapid fatigue failure of the mount. That was my thought too.. but I was trying to be nice and give the OP the benefit of the doubt. In the Pacific N.W. there is so much crap in the water it would be gone in a hurry.. or at the very least the props would be! The cost of an in hull thruster DIY would not be much more than an external one...the cost of the tube and epoxy isn't much. The cost of an electric in hull is 3-5k maybe. I could see a pro install costing another 2-4K depending on the complexity and how many other parts are needed. You could always have a glasser do the tube and the rest yourself to save. Wouldn't outboards strapped to each side of the bow achieve the same end? ( Not being electric, I guess they would be somewhat of a hassle.) Now, before someone jumps me for not being polite & diplomatic, that thing deserves some negative press. Wouldn't outboards strapped to each side of the bow achieve the same end? Funny, that is the first though I had too. Build a mount for an outboard and run a steering cable up to the pilot station. PNW boaters could install an outboard with hydraulic tilt to avoid the flotsam threat. Good to hear from someone in Oz. I had heard there were some twins done and ther is also a 30ft twin for sale on the Gold Coast. Do you know what the key differences between the 30 and 32 are? For all the nay sayers have a look at the Sideshift web site and the unit can be seen on U-tube as well. I was a little skeptical I must admit but another fellow in our marina installed one two years ago and he is meticulous with his boats and says he absolutely loves it. I will let you know, easy to remove if I have to since there are no holes below the water line but I have a feeling that won't be necessary. Makes the first mate a lot more comfortable when docking. wow...a manufacturer/owner who proclaims their product/purchase as great! FWIW, there is a 32 IG moored across from me and I was talking to the owner the other day, he got a quote for a Sidepower thruster which was about $11.5 K all done. Our yard rates are higher than yours up in Brisbane, so if you do as Bruce suggests, buy the thruster in the US and ship it out, getting the local yard to do the install, you may find this to be the most economical route. A suggestion, pay a bit extra and buy the next thruster size up, that is, buy the thruster suitable for say a 40'boat, that extra power on a windy day makes it all worthwhile. Hi, and welcome aboard the board, fellow Brisbanite Mark. Where are you based, by the way? I'm in Springwood, and I have my Clipper 34 down at Horizon Shores. Yeah, great state of Origin win that - sorry Andy...makes the decider in Melbourne really interesting, does it not..? Can NSW win a series, or does Queensland make it 8 yrs in a row...? Sorry...brief off topic wander - couldn't help it. It's funny really, as an ex NZder I find it easier to relate to Queensland State, than I do Australia...must be something to do with size...don't go there..ok..? Now, I don't want to be a wet blanket, but another approach is to get the boat first, as you might find it has one already, but if not, don't rush into it. My Clipper does not, and while sure...the first time or two out we sometimes muttered about maybe fitting a bowthruster... once familar with how it handles, and thanks to tips on this and other forums, (ok, fora for the pedants), we find we hardly ever feel the need now, and that has been the case for about the last 10 yrs. There is a heap of other gear I'd far rather spend good money on than something I honestly doubt I would use more than once in a blue moon. Yes, others who have them will use them more and swear by them, because they adopt methods of manoeuvring that use them, but if you don't have one, you adopt methods that avoid the need, and we have always managed to achieve what was needed without. Just watch the city river ferries - the monohulls, not the cats - and see how they manage at the jetties without bow thrusters. It's not that hard. There are others on here who will agree I think. I & others with IG 32s have a bow thruster and there is plenty of room to install one. I can't comment on the cost as it's been about seven years since purchase. "Don't leave home with out it!"